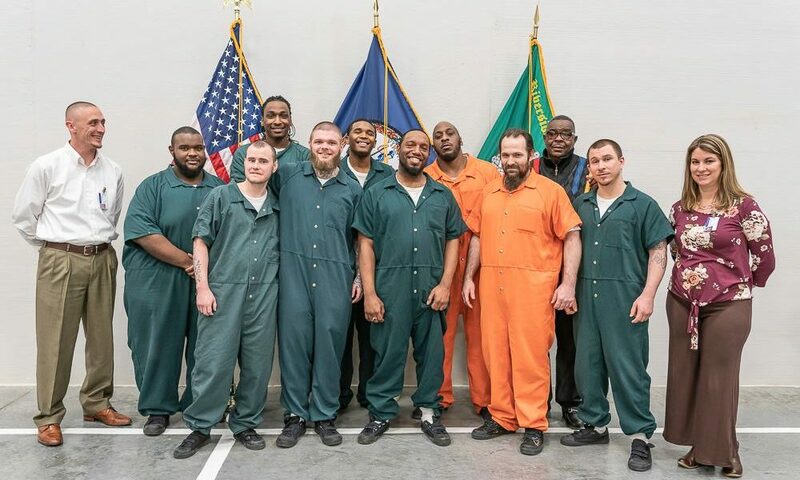 On Wednesday, March 20th, friends, family, and staff members gathered at Riverside Regional Jail to celebrate those who graduated from their Opioid Program ran by REAL LIFE. Former Richmond Sheriff, Clarence T. Woody Jr. was the keynote speaker. He shared his experience transitioning from outside criminal justice work in policing to inside a correctional facility— “the definition of the revolving door.” He never had to see the people he had locked up when he was an officer on the street. But then, after elected Sheriff, “saw the other side.” In an effort to reverse the cycle and give people a “chance at life,” The REAL Program started in the Richmond Jail and evolved into the REAL LIFE Program, a non-profit organization in the Community, founded and directed by Dr. Scarbrough. Former REAL Program staffer, Ervin Hart, is now leading REAL LIFE’s Opioid Program at Riverside. Hart led the group of graduates through the REAL LIFE Opioid Program utilizing the Narcotics Anonymous 12-step program and behavior modification model. For graduation, each graduate prepared a reflection of their experience in the program. The collective focus was hope and gratitude, while sharing personal epiphanies and feats. The group became a safe place for growth, hope, spirituality, and support. Participants were encouraged to look within themselves, keep an open-mind, discover their desire for change and finding the courage to do so. REAL LIFE would like to congratulate all the graduates in their accomplishments. You all demonstrated awareness, persistence, gratitude, and courage—may your story be heard and inspire others! And special thanks to Ervin Hart, C.T. Woody, and all others who support and further initiatives to improve the lives of others! Last, we want to thank Riverside for the dedication they have to providing quality and comprehensive programs for individuals in their custody! Not every facility is so amenable to such programs, but they see it has a priority and support it wholeheartedly, and for that, we (and the inmates) are extremely grateful.